Studio shots, no. 88: Jack Armstrong, supercentenarian. Among the dozens of families who migrated up to Wilson County from North Carolina’s southern Sandhills area were those of Dock Roberson and Margaret Armstrong McDougal Blue. After her husband Levi Blue died in Wilson County in 1919, Maggie Blue and Dock Roberson married, and Maggie’s parents John “Jack” and Annie Murphy Armstrong briefly came to live with their blended family in Taylors township. Likely during this time, Jack Armstrong traveled into Wilson to sit for a portrait in Picture-Taking George W. Barnes‘ studio. Jack’s descendants explained that his curled fingers were the result of an injury inflicted during slavery. John “Jack” Armstrong (ca. 1820-1932), circa 1920. In the 1870 census of Flea Hill township, Cumberland County, North Carolina: farm laborer John Armstrong, 40; wife Anna, 38; and children Dublin, 14, Charles, 9, Penny, 8, Margrett, 7, Elizabeth, 5, Barbry, 4, William, 3, and David, 2; plus Amy Armstrong, 52. In the 1880 census of Flea Hill township, Cumberland County, North Carolina: farmer John Armstrong, 54; wife Annie J., 43; and children Charley, 18, Margret, 16, Barbra A., 12, William J., 10, David, 8, Joe, 6, Daniel R., 4, and Rebecca, 3; plus A. Murphy, 60, mother-in-law. In the 1900 census of Geddies Gin township, Cumberland County, North Carolina: farm laborer Jack Armstrong, 75; wife Annie, 68; daughter Janie, 15; and grandson George W. Murphy, 12. In the 1920 census of Taylors township, Wilson County: tenant farmer Doc Robinson, 55; wife Maggie, 53; children Mary, 18, James C., 19, Virginia, 17, David, 14, Elijah, 12, and Jessie B., 3; Vangie, 32, Geneva, 17, and Addie McDoogle, 15; and Moses Robinson, 8, and lodgers Jack, 103, and Annie Armstrong, 101. Annie Armstrong died 5 April 1920 in Taylor township, Wilson County. 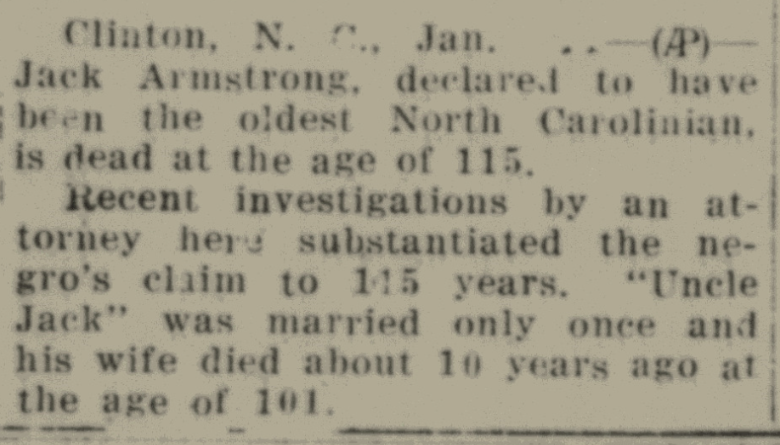 Per her death certificate, she was 103 years old; was born in Johnston County to Annie Murphy and an unknown father; worked as a farmer for George Piage; and was married to Jack Armstrong. William Jas. Armstrong was informant. Maggie Roberson died 5 April 1928 in Wilson township, Wilson County. 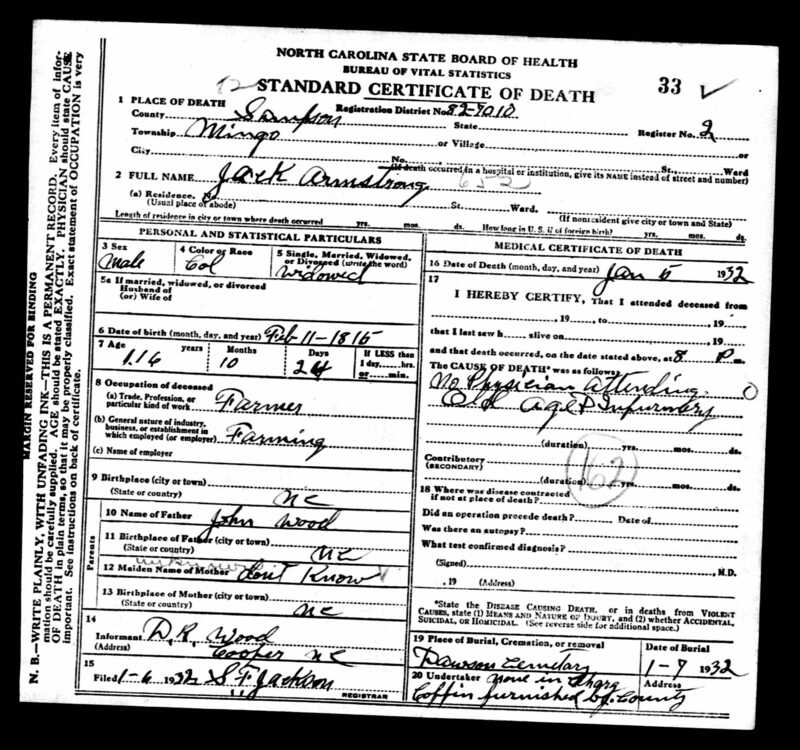 Per her death certificate, she was 55 years old; was born in Fayetteville, North Carolina, to Jack and Annie Armstrong; was married to George Roberson; and farmed for Will Carr. 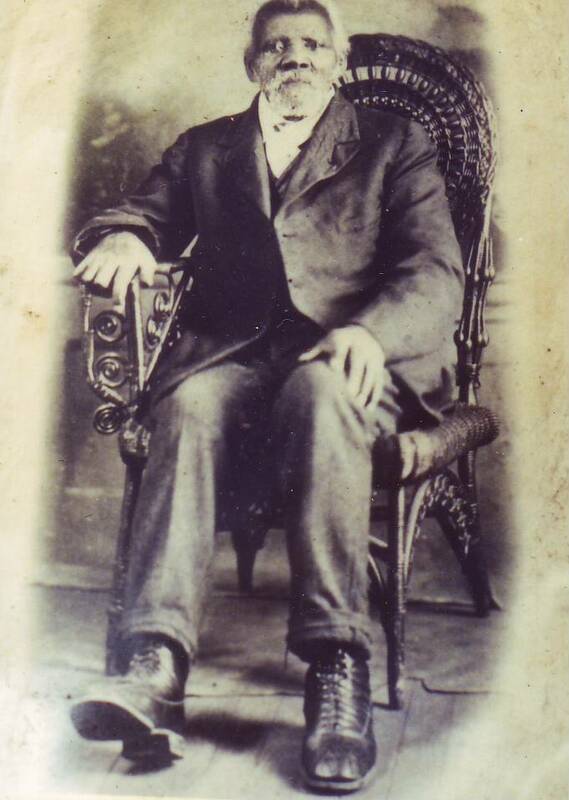 Jack Armstrong died 5 January 1932 in Mingo township, Sampson County, North Carolina. Per his death certificate, he was born 11 February 1815 to John Wood and an unknown mother; was widowed; and was a farmer. Newspapers across the state reported that Jack Armstrong had been “the oldest North Carolinian” at the time of his death. Wilson Daily Times, 12 January 1932. Photo courtesy of F. Cooper Jr., great-great-grandson of Jack Armstrong.